Those who repeatedly abandon official Mann vs Machine server games will be punished. "There are some words that," Saxton Hale bellows - or at least types furiously - "If I have to use them to describe a man, that man is dead to me. Also to everybody else. Because I will kill that man." Or garnish their wages at the very least, but the note is part of a campaign designed to weed out cowards who quit official Mann Company servers mid-match, in Team Fortress 2's co-op game Mann vs Machine. There are two ways to play Mann vs Machine; on a public server, for which you pay nothing, or on an official Mann Company server, and for that you need a ticket. That ticket costs money and, judging by the frown hanging on fictional Mann Company CEO Hale's brow like a thundercloud, some of those ticket holders are being abandoned by their allies just when they need them the most. Players who repeatedly abandon their fellow Mercs will find themselves stuck in a low-priority pool and will face longer matchmaking times. Abandoning, according to Hale, is what happens when you leave an official game without having played through a single wave to completion or failure, and there are five or more players - including you - connected to the server at the time. If you just dropped out the once, maybe because the cat ate your computer or for some similarly understandable reason, there's no problem. Saxton Hale is after repeat offenders, not those caught in unfortunate circumstances beyond their control. 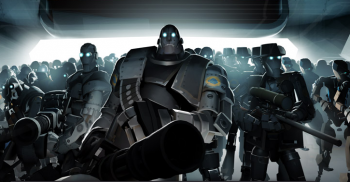 If you're looking for more information, the Mann vs Machine FAQ is a good place to start.